All aspects of the day leading up to the main event play into making your wedding day so memorable. It’s what’s behind the doors that guests don’t see that will make you feel like most special bride in the world. 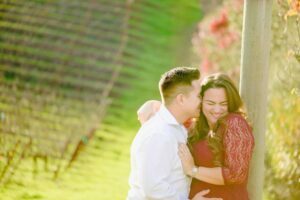 Jessyca not only knows how to coordinate and plan a beautiful wedding day, but how to make the most out of the day. Your wedding day starts the moment you wake up and start getting ready at the hotel. Jessyca arranged for this experience to be on that she and her wedding party would never forget. In the room where the girls got ready, balloons and other wedding decorations were scattered everywhere for pictures and each bridesmaid had their own robe, while Jessyca got the special white robe decorated special with lace. Each bridesmaid also got personalized white goody bags with their names in calligraphy on the outside and other trinkets like a bottle of champagne and accessories in it. To top it all off, the girls had a mimosa bar to utilize during the whole getting ready process. A team of two hair and makeup stylists assisted the bridesmaids, while the mothers and grandmothers of the bride and groom got their own stylist as well. Goody bags for the parents included getting ready robes and personalized handkerchiefs to remember the day by forever. The boys’ side of the getting ready process included matching socks, personalized flasks, and poker! The hotel room for the boys was equipped with a booze table and a poker table for them to relax and enjoy their day. Goody bags for the boys included personalized flasks with their names on it, shot glasses, a funnel, and a bottle of Johnny Walker Black. A personal aspect to the wedding was the matching socks each of the groomsmen wore to match the groom and his love for soccer. A photographer was present in both rooms during the entire getting ready process to capture the moments leading up to their big day. After everyone was done getting ready, it was time for the bride and groom to have their first look. The beautiful and intimate moments of the first look were perfectly captured by Organic Moments Photography. 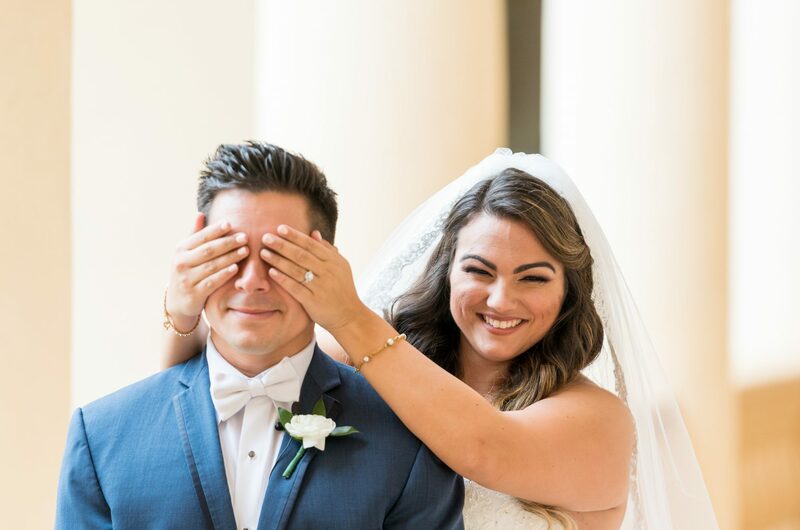 Take a look at the slideshow below to see just how magical the moment the couple first laid eyes on each other on their wedding day was. Following the first look, the couple got into an antique car and drove off together to the church, where their ceremony will begin. The ceremony had many unique aspects to it as well that made it special and individualized for them and their families. Instead of the traditional unity candle, the couple opted for a unity plant, in which they both put soil into a bougainvillea flower to signify their unity as a couple. Another unique aspect of their wedding included the catholic tradition of the lasso, in which a specially made rosary is placed around the bride and the groom to signify their unity in marriage. The remainder of the forty-five minute long ceremony incorporated their family members throughout the readings.